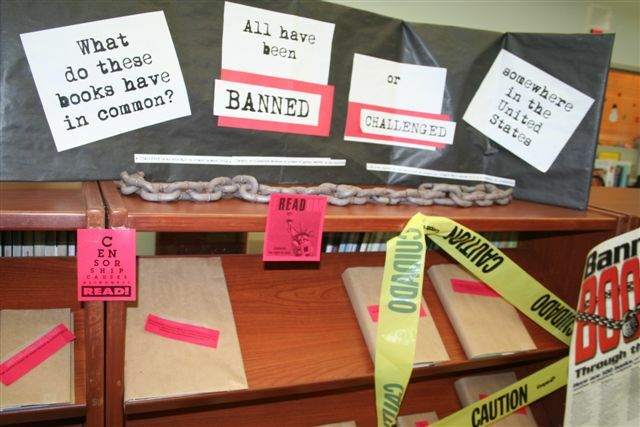 This Banned Book Week display is definitely one of our most looked at displays. “What?? Why can’t we look at these books? …Why would anyone ban this book?…That’s not fair! !” Lots of questions and opinions and LOTS of interests in those books. 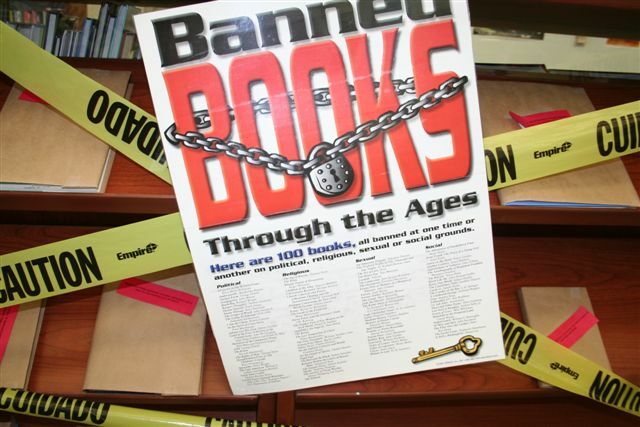 We don’t allow them to check out these books during the display week, they really are banned. But there’s always some brisk checkouts after the paper covers are uncovered. 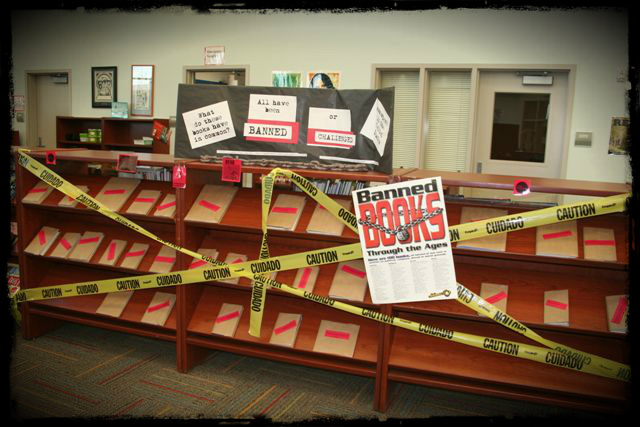 The students seem pleased to say they have read a banned book…so rebellious they are! This display is right in the middle of the library on the shelves we usually feature our new books, where there is lots of traffic. 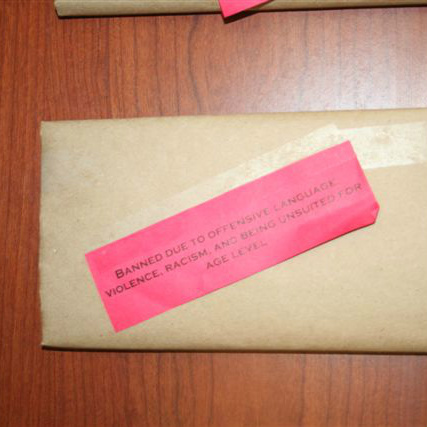 We pull many of the books in our library that have been banned or challenged in the past and cover them with brown paper. 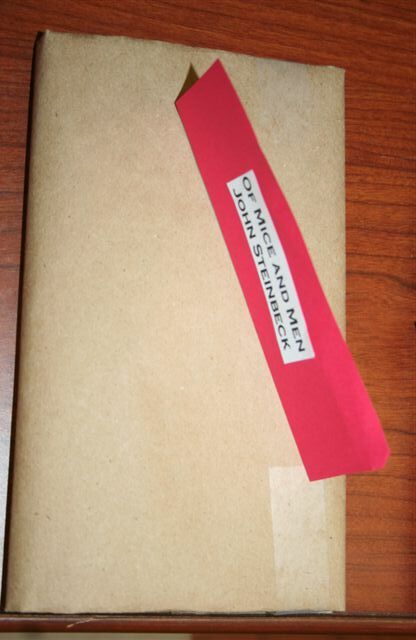 Then on the front we tape a piece of paper stating why the book was banned, and if they flip it up, there is the name of the book. The kids love going to each book and being shocked on why, say, Of Mice and Men was banned. Adding the “Caution” tape adds an element of intrigue, don’t you think? But this really does gets the kids touching books, discussing the topic, and forming a real opinion on this subject. We actually came up with this display idea three years ago, and it was quite labor intensive to cover all those books in brown wrapping. So we just slipped the paper off when we were done and saved them. This year, since none of our current students saw this display, we recycled it with a fraction of the work! Great display, not much work, celebrating the right to read – win!